RECRUIT is a program that was developed at the University of California, Irvine, to manage the entire faculty recruitment process. UC Davis began its use of RECRUIT in the summer of 2012. The system allows applicants to apply electronically and securely, and enables search committees and administrative staff to manage the recruitment process electronically and securely. In addition, this system provides the Office of the President accurate end-result data regarding campus recruitments. Applicants can browse open positions on campus, apply for one or more recruitments, identify their references, and provide requested information in order to complete their application(s). References can submit their letters of reference electronically and in a secure fashion. UCD faculty & administrators can view and manage positions and applications for both Senate and Federation recruitments. Staff users must complete RECRUIT training in order to have access to the program. We require all staff users of RECRUIT to receive training prior to using the program. Academic Affairs staff provide this training. Please feel free to contact Kim Poole (kcpoole@ucdavis.edu or 754-7101) or Kelly Anders (kanders@ucdavis.edu or 754-8268) to schedule a training session. All who complete training are encouraged to practice in the training website to become more familiar with the system. 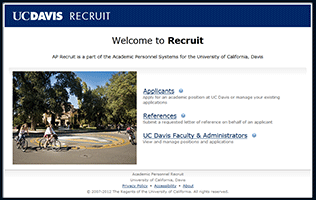 Questions on the use of RECRUIT should be directed to the Recruit Help Desk: ap-recruit@ucdavis.edu. *Please be aware that the training website will send real e-mail messages!